It has been hot here in Ohio and it is only the beginning of May. One thing that is great during hot weather is ice cream. When I worked at Vitamix, I remembered other employees raving about how easy it was to make ice cream with frozen bananas in a Vitamix blender. I did some additional research and combined the Vitamix recipe with a few other items that I thought would be great with bananas and would work well with my Vitamix Certified Reconditioned Standard Programs machine (Pro 500 model). If you didn’t know, I am a huge peanut butter fan. I have a simple rule; anything with peanut butter tastes better. Below are the steps to make healthy and cool treat. This is something that can be made, then frozen. I recently made a batch that lasted a few days. This tastes great with Hershey chocolate syrup, peanuts, and whip cream. Turn machine on and slowly increase speed to Variable 10 or High. In about 30-60 seconds, the sound of the motor will change and four mounds should form. You may start to notice a slight smell from the motor, but don’t worry. Stop the machine and scoop the frozen treat from the container. This is a simple and healthy recipe that can be made in less than 10 minutes. It literally took me longer to clean up than it did to make. I am looking forward to trying this recipe with other ingredients. The best part of this recipe is that if you mess up or end up making a batch that isn’t good, it is only a few bananas and 5 minutes of time. Let us know what you think of this recipe. If you have any questions, please contact us. 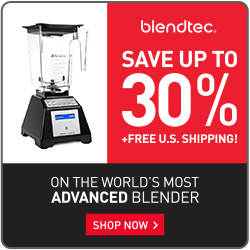 Next:Which Blendtec Blender is best for you?